Three hits were enough for the Lehigh Valley IronPigs to lock down a game 3 victory, as the the Phillies' Triple-A club swept the Pawtucket Red Sox right out of the International League Governors Cup playoffs with a 3-1 victory. 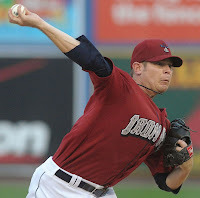 Minimal offense was required for the 'Pigs, as veteran hurler Brian Bass tossed a 5-hit complete game. The 29-year-old right-hander took a shutout into the ninth inning before letting up an unearned run. The effort by Bass marks the third consecutive start in which he did not allow an earned run. In his most recent six starts, Bass has posted a 1.62 ERA. On the offensive side, third baseman Kevin Frandsen drove in two runs with a pair of ground outs in the 1st and 6th innnings, respectively, and second baseman Josh Barfield slugged a solo homer in the 2nd frame. All three runs and the loss were charged to Paw Sox right-handed starting pitcher Alex Wilson. Lehigh Valley is now set to meet the Columbus Clippers in the best-of-five IL Championship Series, on the road, beginning Tuesday. Columbus swept Durham in their opening round series. In game three of the divisional round of the Double-A Eastern League playoffs, the Reading Phillies dropped the second of three meetings thus far, by a score of 1-0, to come within a game of elimination. Righty All-Star Austin Hyatt, who was 3-0 with a 1.00 ERA against New Hampshire in three previous starts this year against New Hampshire, went 7 innings and allowed 3 hits, no walks and 1 run while striking out 9, but took the loss, as he was out-dueled by Fisher Cats righty Drew Hutchison, who threw 6 scoreless innings, and three relievers, who each threw one scoreless frame. Trailing 2-1 in the best-of-five series, the R-Phils and the New Hampshire Fisher Cats will go at it once again at Reading's FirstEnergy Stadium, Sunday at 6:05 PM.